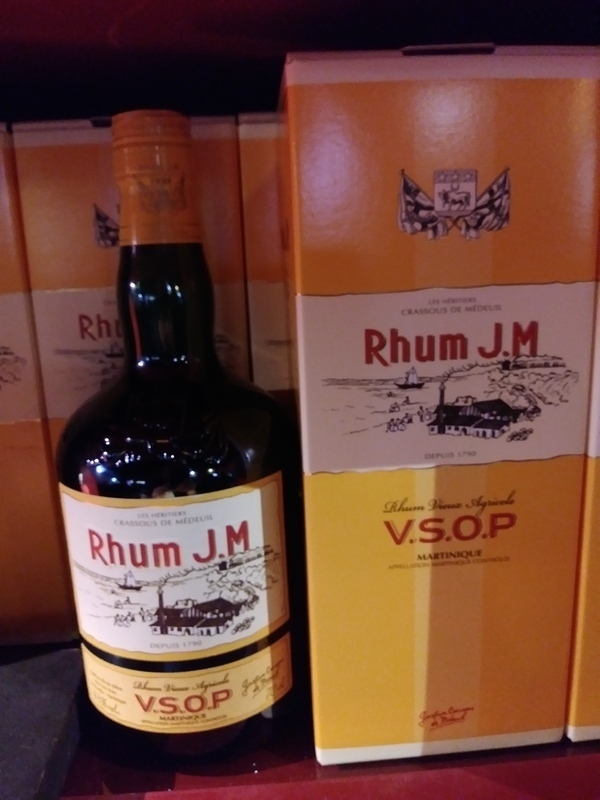 Have you found an online vendor selling Rhum JM Vieux VSOP? Most of the agricole rums I've tried have been from Clement and I have liked them all to varying degrees. I even managed to snag a bottle of Rhum JM Gold which I liked rather well (rated it an "8"). 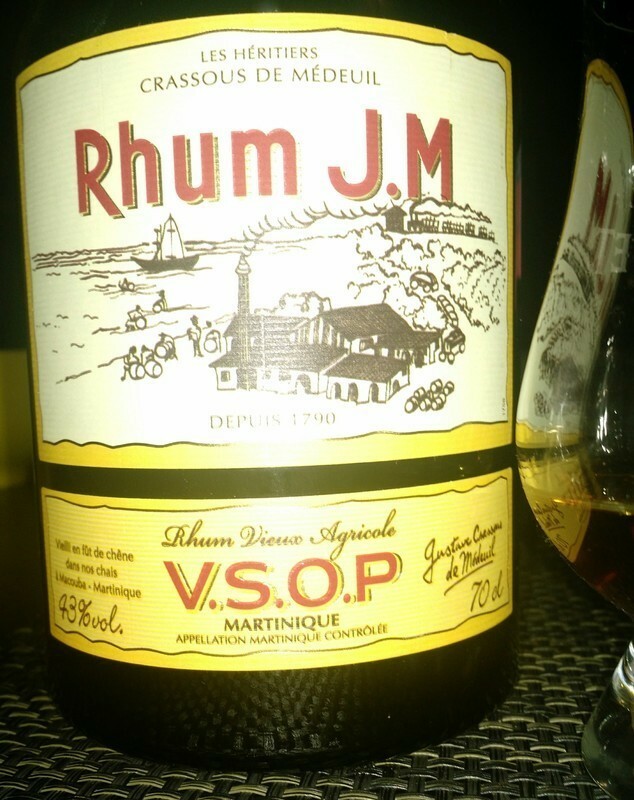 So I had rather high expectations for the Rhum JM VSOP. First thing is that apparently at some point they redesigned the label on the bottle. The bottle above used by RumRatings has an older label which has an old world charm to it with the artwork and hand lettering. Looking at it reminds me of the era of Henri de Toulouse-Lautrec and his poster art of the late 19th century. The current label all but eliminates that impression. The art on the earlier label had a more ornate and interesting portrayal of what I assume to be a distillery of some historic point. The lettering was made to look as if it were done by hand (and it very well could have been so). The colors had an artistic feel in of themselves. The newer label lost all that charm in my opinion. The lettering is all mechanical (even the cursive). The artwork is much plainer. And the colors have no depth at all. It is less appealing. Now off my art critic soapbox. Let's look at the rum itself. It is a deep amber color with a hint of bronze. It has nice legs and beads of the rum cling to the sides after settling from a swirl in my snifter. It has a recognizable agricole aroma but nothing harsh. The flavor does have that grassiness and funk normally associated with agricole rums but this rums seems spicier. A definite pepperiness. And strong. Really strong. There is just a hint...and I mean minute hint of cane juice sweetness but this is a dry rum. Also it has a rather strong and lengthy burn. It is a slightly higher proof than most rums (43% ABV - 86 proof) but the burn is one I would expect from 95 proof or higher. The finish is dry as I would expect. However there is a flavor in the mix that I cannot quite identify. It is a flavor that I find odd and out-of-place. Sort of a kerosene type of flavor. I don't like it whatever it is. It's very pronounced on my palate drinking it straight however on the plus side it does seem to be lessened when used in Coke Zero. Just be careful not to overdo it on the rum. About an ounce-and-a-half for a 500ml (16.9 fl oz) bottle of Coke Zero seems to work best for me. I also think it would work well in citrus-based drinks. I haven't had the opportunity to try some. The downside is the price. At $50 USD a bottle (I've seen it as high as $60 USD online) it is a pricy rum. Frankly I don't think it's worth it. It's far too harsh to be a sipping rum and the strong flavoring limits it as a mixer. I had higher expectations for this rum and was disappointed. I feel the Rhum JM Gold is much better as agricole rums go. 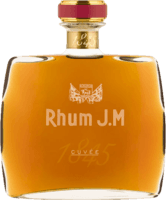 There are comparable agricole rums that are less expensive and better than the Rhum JM VSOP. This is a very unique and interesting rum that is unlike any I've tried before. Smells and tastes of charred oak and spice (pepper, clove, and cinnamon). Maybe a hint of black cherry. Has a nice bite at 43%abv and would pair well with a cigar. It seems like a pretty good spirit, but I prefer a little more sweetness. This is dry, almost bourbon like. A decent tasting rum for sure for people who prefer a bit less sweetness in their rum. I have had better Agricole rhum but I have also had worse. The VSOP has a burn factor to it from the strong pepper notes as well as form the intense alcohol taste. You definitely get the earthy, grassy taste with some oakiness and some smoke notes as well. This is an ok rhum to drink straight. The price, however, is too high for a rhum like this. Een lekker pittige rhum agricole van Martinique's mooiste distilleerderij Rhum J.M. gelegen aan de voet van de vulkaan Pelée en vlak bij de Atlantische​ oceaan. Het gekapte suikerriet wordt binnen een uur geperst en het sap in de fermentatie tank gepompt. Na een korte vergistingaperiode wordt er gedistilleerd in dubbele column stills. Een drietal jaar op ex-bourbon vaten later levert een rhum op met die typische 'grassige' agricole smaak maar ook rokerig eikenhout en specerijen als peper, kaneel, noten en fruitige tonen als banaan en grapefruit. Een lichte en droge rum gebotteld op 43% abv (die merk je op) waar niet mee 'geknoeid' is want dat is tegen de wet op Martinique. My first crack at RHUM JM. Very strong smoke taste that grows on you quite quickly. A lot of rooms are close in flavor but this one is distinctly different. Like it or not, you will definitely remember it. A very good aged agricole style rum. It's my favorite aged agricole so far to sip. Time for Birka’s rumcruise 2019 at the Baltic Sea. This one was included at Ian Burrell’s “Blindtaste” Master class. It was quite easy to get it right, cause it was the only Agricole included. I think it’s quite alike the XO but with a little less of everything. So it’s maybe an even better Agricole to start with if you want to start a tour in the Agricole world. 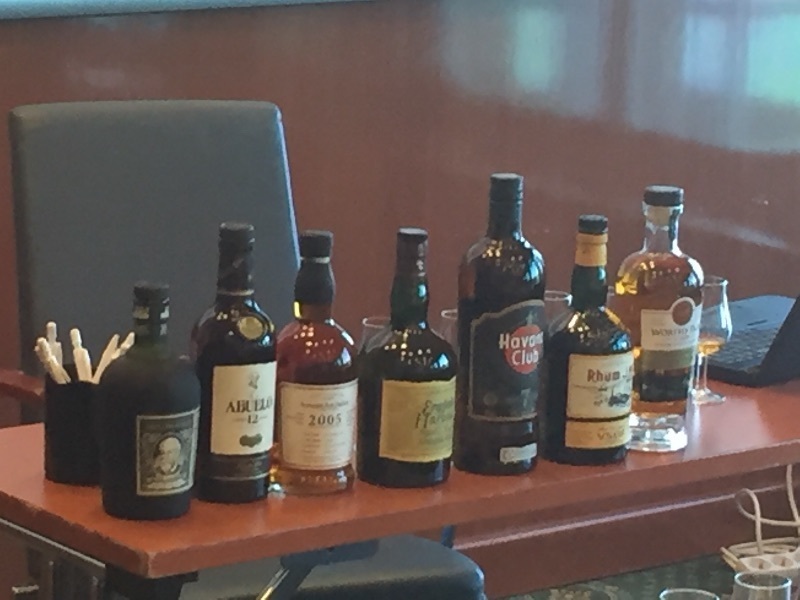 Picture: The rums included at the blindtest. Here we go again with yet another Martiniquan rhum agricole that the cane juice too easily picks up on the wooden flavors. Since this one is a fairly young VSOP, it has less of the wood than the 10 Year Clement that I just rated. This one is also way over priced at $58 and I found it at the next liquor store for a whopping $15 cheaper. Even if I had got the cheaper priced one, this rhum is still not a good buy. It almost reminds me of Ezra Brooks 101, which is a dirt cheap Kentucky bourbon. Stick with the cheaper J M Rhums for your first try. In the end, this rhum is nothing more than an expensive mixer. This particular agricole was salty during nosing, then grass and compost and after careful extraction also cognac barrels. Très sucré pour du agricole mais pas si facile à boire à cause de l alcool beaucoup trop agressif pour moi. For those who don't know.. R'h'um as opposed to 'R'um, is made using raw sugar cain juice squeezed directly from the freshly cropped plant. Rum on the other hand is made using the molasses extracted from the sugar cain. This makes for a much dryer, Earthier taste. On the nose- a little funky with grass and dried fruit. First sip- sooo different than other agricoles I've tried. Spicier than others. Sweet but dry with citrus and pepper. Earthy tones but not overwhelming. Very, very well balanced and nice smooth tingle on the finish. I've read other reviews saying this was harsh and tasted like pure alcohol but I think they're crazy. This is so delicious that im mad at myself for not having this in my bar all along. If you see it. Get it. Thank me later. Nice and classic agricole with pleasant aftertaste. The pallete doesn't fit in with the aromas or finish, otherwise this would be really nice! On the nose you get cherry cola, with vanilla coming out more as it airs. In the mouth however, it's just wood and grass, with a slightly hot and oily feel. I don't really know how the aromas and taste can differ so drastically, but they clearly find a way! Then on the finish, there are creamy notes of vanilla, marshmallow and raisin. Should I find myself in the mood for agricole, I would happily turn to this bottle. It's just that with so many more frankly more enjoyable non-ag rums out there, I don't see myself ever pining for agricole, which really makes the previous statement moot. Rum agricolo, invecchiato per 3 anni in botti di rovere ricarbonizzate, che contenevano Bourbone, per poi fare una finitura in barrique nuove di rovere americano. È un buon distillato, garantito anche dalla AOC (Appellation d'origine contrôlée) Martinique, non molto complesso, ma che dovrebbe costare forse un po' meno. All'olfatto: abbastanza intenso con prevalenti note agrumate ed erbacee tipiche dei Rum agricoli; subito dopo, facendo svampare un po' l'alcool, si avvertono note più morbide di chiodi di garofano e leggera vaniglia. Al gusto: chiaramente prevalgono da subito le note erbacee ed amarognole tipiche degli agricoli, subito smorzate da una nota più morbida ma leggera di cocco, vaniglia e di legno. Il finale è medio e la bocca resta pulita. Rum con una complessità media ma di buona fattura, adatto a chi si vuole avvicinare ai Rum agricoli, che per esprimere il massimo delle loro qualità dovrebbero avere un invecchiamento che va dai 3 ai 7 anni al massimo. Consiglio per tutti: quando annusate un rum (o qualsiasi distillato), prima di inserire il naso e inspirare, effettuate un leggero soffio nel bicchiere e subito dopo provate a sentire i profumi. Questa operazione serve a svampare un po' la potenza dell'alcool che altrimenti vi porterebbe a bruciare nel naso e ad anestetizzare il vostro olfatto. Agricultural rum, aged for 3 years in reclaimed oak barrels, which contained Bourbone, and then finished in new American oak barrels. It is a good distillate, also guaranteed by the AOC (Appellation d'origine contrôlée) Martinique, not very complex, but that should probably cost a little less. On the nose: quite intense with prevalent citrus and herbaceous notes typical of the agricultural Rum; immediately afterwards, causing the alcohol to flare a little, there are softer notes of cloves and light vanilla. On the palate: the herbaceous and bitter notes typical of the agricultural produce immediately prevail, immediately dampened by a softer but light note of coconut, vanilla and wood. The finish is medium and the mouth remains clean. Rum with a medium complexity but well-made, suitable for those who want to approach the agricultural Rum, which to express the maximum of their quality should have an aging ranging from 3 to 7 years at most. Advice for everyone: when you smell a rum (or any distillate), before inserting the nose and inhaling, make a slight puff in the glass and immediately afterwards try to smell the perfumes. This operation serves to arouse a bit 'the power of alcohol that otherwise would lead you to burn in the nose and to anesthetize your sense of smell. This 43% dram is very gentle on the nose. Maple, candy, cherry, hint of solvent. Mouth - I like it! Rather woody, smooth, and complex. I could just sip this one all night. This is among my very favorite aged agricoles. Velmi silný a hrubý rum. Není vůbec mým šálkem kávy. Proto bohužel hodnotím takto subjektivně. Silná alkoholová chuť. Pepper overload is what you get from the Rhum J.M. VSOP. It is super dry, like a cognac, but the pepper smell and taste will hit you straight in the face. If you like Rhum Agricole, add 3 points to the score. If you like sweeter rums, go for at least 50 better rums than this one! The smell of grass, fresh barrel and varnish. A lot of bitterness. Nothing remarkable, except for a strong barrel. It reminds a cognac. I spent a lot of money on this, do not repeat for me if you are looking for a good rum. After trying the gold version, I was actually hoping for much more from the VSOP. It started great though, nice dark color, and very very nice sugar cane smell with some notes of Banana (which I think). But then tasting was a complete other story. The alcohol is quite strong and the burn too present, so you don't really taste the aromas. Great start but a disappointed end.